Yesterday was a difficult day in the studio. Once again I’m frantically working under a looming deadline, and I messed up. 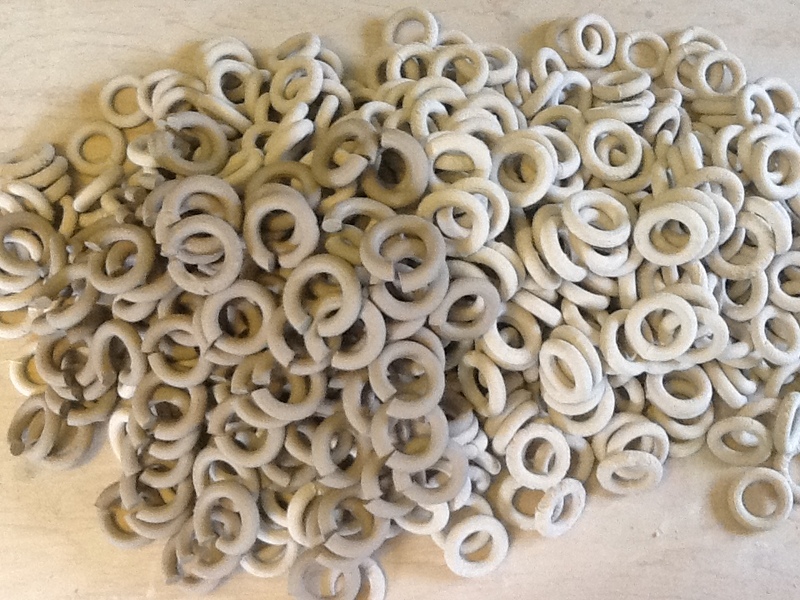 I squeezed out 30 or 40 pounds of rings, and they were all the wrong size. They even took a long time to dry, so by the time I noticed my mistake I had wasted the better part of two days. Ultimately, it’s no big deal. I have plenty of work ready, and plenty more ready for raku tomorrow. I’m ready for this show. Regardless I have a difficult time moving on from failures like this. They mess with my confidence and can stall perfectly good ideas. Physically these failures are starting to pile up. There are bags and boxes scattered throughout my studio overflowing with failure. Sometimes I look at them and have powerful memories. The finished piece that crumbled out of my hands and smashed on the floor as I was moving it into the kiln. The many times I over slept and my coiled rings went bone dry on me. Mostly I just step around them and pretend they aren’t there. It is long past time to deal with this problem, with all its many facets. Thankfully, I think I have an idea. This entry was posted on July 1, 2012 by jasongordonholley. It was filed under Uncategorized . I have a failure graveyard. I bury things that don’t work in the backyard. Some day a future landowner is going to find some very odd things, in-between the dog skeletons.